Elements is the most important restaurant in New Jersey, and Scott Anderson is the state's most progressive chef. As we eagerly await its reopening, scheduled for summer 2015 in downtown Princeton, here's a look at a very early review, published in September 2009. Henri Matisse rocked the art world in the summer of 1905 with "Open Window, Collioure." The painting depicts sailboats in a Mediterranean port, but Matisse painted his waves pink, his sky turquoise and periwinkle. The work is provocative and vibrant, and it rewrote the rules for using color. "It was one of the first places where the world got a glimpse of what art would be in the 20th century," according to the National Gallery of Art in Washington, D.C., where the painting is displayed. It would be premature to christen Elements chef Scott Anderson as the Matisse of the culinary world. But Anderson is no doubt among the handful of young and progressive American chefs who are pushing American cuisine forward, who are preparing and pairing ingredients in a thoroughly new, modern and dynamic way. Like Matisse and his color palette, Anderson is taking something intrinsic to his work – the ingredients – and throwing out the rules – freeing them from their former constraints and applications. Matisse's paintings are evocative and thrilling, not simply a replica of something already found in nature. Anderson's work, too, is not just a replica of the meals you already know. Anderson calls it interpretive American cuisine, and we found it as vibrant and liberating as a Matisse painting. At Elements, we felt as though we were dining on the cusp of the future. Princeton is an odd location for such a radical chef. The town itself is erudite, traditional and somewhat fussy. And, yes, some culinary awakening has begun, but Princeton was historically and notoriously bereft of great places to dine, as if food were not noble enough to be a scholarly pursuit, but instead offered mere sustenance, a pragmatic necessity that could never be entwined with truth, beauty or even science. Like Albert Einstein and his famous inability to tie his shoes or comb his hair, Princeton seemed to take a dim view of the commonality of dinner; in the grand scheme of things, did it really matter? Indeed, the dinner party joke in this town was that you could always be sure your host would serve a great malt Scotch, but you might also get supermarket crackers topped by cheese from a can. Elements is an odd fit for Princeton on the architecture front as well. Designed by Anderson's friend, Bob Steele, the entire restaurant is made of real stuff – wood, stone, metal. It's functional and hip, slightly modern in a '70s California sense, a bit sensible and a bit whimsical. It's part Brady Bunch house, part Frank Lloyd Wright. Plus the restaurant sits next to a Shell gasoline station on Bayard Lane, well away from the bustling downtown, and is quite easy to drive past. "We're off in our own little world," says Anderson, who immediately realizes his unintended double meaning. But what a special and unique world it is, a point underscored with one look at the cocktail menu – even the drinks are not what you know, with house-infused vodkas and homemade tonics to go with your gin. The primary emphasis here is on local and fresh, but Anderson culls ingredients from all over the world and is inspired by many different cuisines. The menu, attractively presented on parchment paper, changes weekly. Scallops ceviche ($15) were lovely little slippery things, both decadent and primordial, served with yuzu juice (a Japanese citrus) with crisp cipollino onion rings. Housemade cavatelli ($13) is to-die-for pasta with rich lamb bacon, fresh fava beans, tender and nutty, and rich grana padano. Even the simply named market salad ($14) is a panoply of tastes, with quinoa, tangerine and nettlesome. The grilled octopus ($13) was the one misstep of the evening, a bit tougher than it should have been. Veal chop ($28) is an outrageously thick and tender cut of milk-fed veal, prepared in a classic French technique. But the combination -- the quality and cut of the veal plus the preparation – is so uncommon that you'll swear you've never had veal this sweet, this succulent. And you haven't. Filet mignon ($36) is just as tender but also robust, served with house bacon, arugula and truffled aligot. Aligot loosely translates as French mashed potatoes, but, like many things French, is so far beyond mashed potatoes that it can barely stand to admit to the same humble origins. These are potatoes, cheese and crème fraiche whipped to heavenly proportions. Short ribs, too, defy their humble beginnings, these being entirely unlike what you've come to define as short ribs. 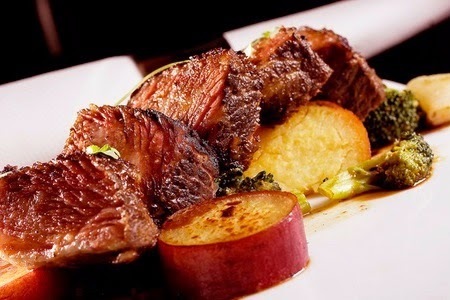 As Anderson describes his short ribs, they eat more like a ribeye steak. First the beef is taken off the bone, vacuum-sealed and soaked in a water bath for 48 hours. These short ribs are so tender you won't be fit to eat regular short ribs again. Local scallops ($32) were succulent, served with 50-year-old balsamic vinegar, porcini mushrooms and pancetta. Desserts follow the same kitchen philosophy – to redefine what you know. Carrot cake ($10) is not cake per se but small cubes – like tiny gifts – of local carrots and raisins, spiced surprisingly with cardamom. A rhubarb ($11) dessert – offers a trio of delights – shortcake, cobbler and mousse, and its distinct taste is not muted by too much sugar or the addition of strawberries. The kit kat ($11) is a gourmet version of the popular candy bar, with gianduja – chocolate with hazelnut – plus more hazelnut. The mille-feuille ($11), oh-so-delicate and lush, is panna cotta made with local honey, served with apricot and Sicilian pistachios. Our service was absolutely impeccable, with both flair and an intimate knowledge of every ingredient on the menu – quite impressive, considering the weekly menu changes. We were impressed, too, with the end-of-evening hospitality – noting our curiosity, the staff offered a peek into the open kitchen and chef 's table, a tour of the private dining room and the upstairs 57-degree wine "cellar." As a chef, Anderson is a bit unusual – he doesn't like sugar ("I can't eat a whole dessert") or fresh tomatoes ("I'm not one of those guys who can slice up a tomato and put it on a piece of bread and eat it."). Nor has he had any formal culinary training. He graduated from Rutgers University with a degree in psychology and sociology. But he did work at the famed Ryland Inn, which offered an intense training ground for many great chefs in the state. And he does look at cooking as a scholarly pursuit, using the kitchen computer as frequently as the stove, constantly Googling for an unusual ingredient, a new technique. American cuisine is all interpretive, says Anderson. It adopts flavors from all over the world, and has always done so. "Basically, I can do anything I want." Elements is less than a year old, and certainly opened its doors in less-than optimistic times. But Anderson says these are Darwinian days for restaurants – the mediocre ones will die out, and those that survive will come out shining. Clearly, Elements is a vivid and bright addition to the state's restaurant scene. And Anderson's philosophy – cooking without limits, experimental interpretation – is liberating and evolutionary. It's erudite, forward-thinking, scholarly. It's food, but it's also science, and, yes, art. This review was first published in Inside Jersey magazine in September 2009.